Since moving to Green Bay, the most common question that I am asked is if I am a Packer fan. No, I am not. I’m not a fan of ANY NFL team. Or any sports team actually, besides the Badgers – being a supportive alum and everything. However, since I don’t want to get shot, I say, “Well, I’m learning to be a Packer fan.” Lies. All lies. I’m faking. I don’t ACTUALLY care what team wins or loses. But I lie anyways. Now that I’m not living under my parents’ roof, I seem to find lying easier. Not big lies, but small lies – like the Packer thing. Maybe it’s easier now that I’m away from my mom’s wrath, as I am the only one of her 7 children that got soap in my mouth for lying. Trust me, I never lied to her again. Not even to tell her that I liked her shirt when I really didn’t. I straight up say, “Mom, I don’t like that shirt.” I can’t get soap in my mouth, because I’m telling the truth, but I CAN get dirty looks/”Why are you so mean to me? !” comments. Oh the life. So anyways, during the fall I would come up to Green Bay just about every weekend to visit my darling boyfriend Skywalker (see Cast of Characters on the side bar). 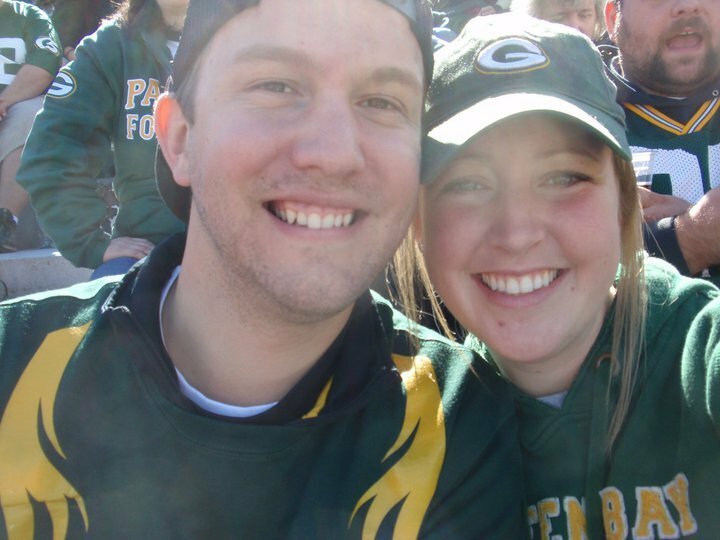 I never realized what a Packer fan he is until this year, because Sundays were spent watching the Packer games, getting excited about Jordy something or other, and commenting on how ugly Clay Matthews is. I would comment on the ugly, but generally spend the games on the internet or reading, glancing up at the TV when he would yell or jumping from my seat when HE jumped up and screamed. He is a different man when we watch the Packer games. People here are crazy. I drove past a prom dress type store a couple days ago and saw in the window that all the mannequins were going to the Packer prom. Really? I mean, who would REALLY buy a dress that is bright yellow and emerald green? WHY do the Packers have to have such a horrible color combination?! The people paint their houses these hideous colors. There is a fence painted yellow with green writing across from Lambeau field that says “IN COACH McCARTHY WE TRUST”. THAT is sickening. If the Packers win, the city celebrates. If the Packers lose, however, a dark, stormy cloud forms over Green Bay, and people don’t come out of their houses for days. DAYS. From what Skywalker has told me, the mood at work shifts to one of irritation, annoyance, and anger. I’ve been lucky – since I’ve started working the Packers have been on a winning streak. I will OBVIOUSLY be taking all of the credit if they go to the Superbowl. If they don’t – not my fault. On Fridays at work, you can wear Packer gear. I do not OWN any Packer gear. And I get made fun of by Donald for it – the biggest Packer fan that has ever lived. I don’t leave my house on game days for fear of getting shot because I’m not wearing Packer stuff. It’s a scary world up here. On Monday mornings, all of the radio shows talk about the Packer game that everyone just watched the weekend before. On Friday mornings, they talk about the Packer game that is coming up. This weekend is the battle between the Packers and Bears – the biggest game EVER, fighting for the NFC Championship. They haven’t played each other in the playoffs since 1941 – Donald even knows the exact date (December 14, if you’re wondering…)!! The day could end in married couples getting divorced, TVs being broken, or even people calling in sick to work on Monday, all depending on the outcome. I’m not kidding. I will be watching the game in my non-Packer attire, although, for next season I MAY have to break down and buy something, just because I don’t want to be judged. I mean really, who likes to be judged?